The Team at Up the Creek Farms will forever encourage all things photo & film since they are the longest lasting take-away that captures wedding day. 📷 From photo back drops and photo booths, to Polaroids and wedding hashtags + social media filters, to photography and videography, we encourage taking time to plan how the day will be captured. Including a wedding film in your wedding plans/budget will never disappoint, and the film will be one that you watch for decades to come with friends and family. This week we are delighted to feature 2 “Reel” Weddings beautifully captured by Love & Lustre Weddings in December 2017. Love & Lustre Weddings is a fine wedding film company based out of Orlando and traveling the state of Florida to capture true love through the joining of two souls in marriage. 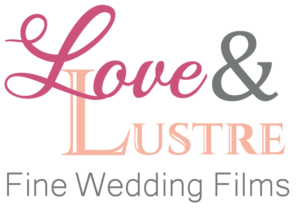 Love & Lustre Weddings is run by husband & wife Corban & Mandy, which is the key love and focus behind each and every wedding film they create. Read more about this dynamic duo by clicking here! Their films are sharp, colorful, and heartfelt, plus they offer a one month turnaround for the highlight film. 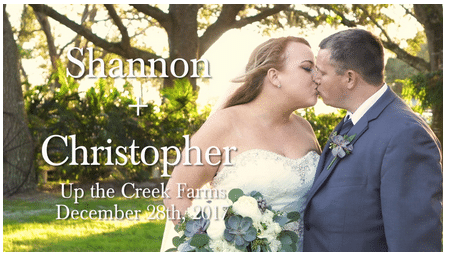 Sit back, relax, and enjoy a sampling of their work during their time at Up the Creek Farms celebrating two amazing couples! Click the photos below to watch Love & Lustre capture wedding day magic! What better way to capture surprise Samba dancers led by the bride? Video! 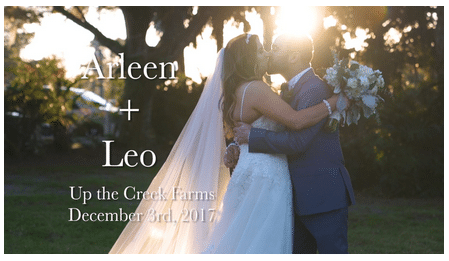 We love this surprise from Arleen to Leo at their wedding reception (check it out at 6:21 into the film). Arleen looked FABULOUS! Their dance moves made us want to take lessons and buy a fun new outfit. True love as two families become one captured on film! Shannon & Christopher’s ceremony was full of super sweet emotion, from the moment the groom and bridal party started down the aisle at 1:21 into the video. This is the prime example of love & family. Thank you to Love & Lustre Weddings for capturing such beautiful days for our Up the Creeks Farms Brides & Grooms of December 2017!